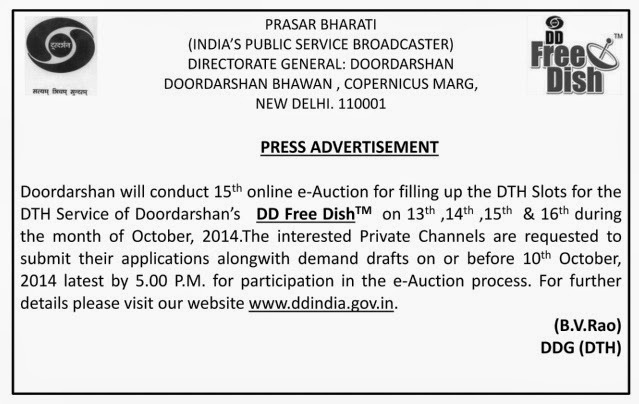 Prasar Bharati has decided to conduct 15th online e-Auction for filling up the DTH slots for the DTH Service of Doordarshan’s DD Free DishTM on 13th,14th, 15th, & 16th October, 2014. The e-Auction will be conducted by M/s. Synise Technologies Ltd., Pune on behalf of Prasar Bharati (DG:DOORDARSHAN).. The reserve price is Rs.3.00 Crore., but the participation amount (EMD) in the 15th e-Auction (2014) is Rs.1.50 Crore which will be deposited in advance on or before 10-10-2014 latest by 5:00 P.M. alongwith Processing Fee Rs.10,000/- (Non-refundable) in favour of PB (BCI) Doordarshan Commercial Service, New Delhi and Applicants are also requested to deposit a Demand Draft of Rs.5,500/-, Registration amount (mandatory) favouring M/s. Synise Technologies Ltd., payable at Pune at the time of submission of the above Application. The applicants must provide their e-mail Address, Contact Numbers & Uplink/Down link permission documents received from the concerned Ministries with the Applications otherwise their application will not be entertained in any case. The demand drafts of unsuccessful Bidders will be returned immediately or within a week after the e-Auction process is completed. Source: from DD India official Site.